Have you been busy doing back to school shopping? We have been at my house. It actually started back in early July for me, when I started to do some uniform shopping online. Then came the early school supply ads that we would pick up while we were out. Now, it is down to finding those things we don't yet have on our teacher supplied supply lists, the missing pieces of clothes and shoes and preparing the pantry for back to school snacks, lunches and breakfast (the kids eat at Daycare most days in the summer). Just yesterday, we stopped by Target to pick up some supplies - loose leaf paper, pens, lunch supplies, disinfectant wipes and more. 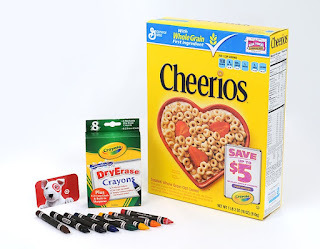 One of the things that we picked up were General Mills Cereals that feature a fun coloring activity on pack and coupons to save up to $5 on Crayola products (available exclusively at Target). We grabbed Lucky Charms and Cinnamon Toast Crunch - they were on sale for $2.99 a pack and we had $.50 coupons for each that are available online (coupons.com). "With only a few short weeks before school bells chime and you’re back in your weekday morning routines, now is the perfect time to stock up on your kids’ school supplies and on-the-go breakfast favorites. With Crayola® and General Mills teaming up at your local Target, you’ll be sure to pass back-to- school prep with flying colors! This back-to-school season will be as easy as 1-2-3 with a little help from General Mills, Crayola, and Target, the one-stop-shop for all your back-to-school needs! Head to the front of the class and check out www.GrocerySavvy.com where you’ll find even more coupons for back-to-school, recipes, and a special 2012 “Grocery Savvy Crayola® Back To School” Sweepstakes! Be sure to enter the sweepstakes for your chance to win one of the 700 Crayola® 8-count Washable Dry Erase Crayons or one of 20 Crayola® Dry-Erase Activity Centers Zany Play Edition." Giveaway will remain open through September 10th. Giveaway is open to residents of the US only. One winner will be selected through Rafflecopter. The winner will have 48 hours to respond or a new winner will be selected. No compensation was received for this post. The product, gift pack, information, and additional sample have been provided by Crayola, Target, and General Mills through MyBlogSpark. All opinions expressed are entirely my own or that of my family. Their Crayons are the best out there! I love the color wonder products...no mess! They have way too many products to choose just one favorite! The crayons are the old stand by though. I love Crayola Crayons. Loved the 64 count box when I was a kid. The Crayola Crayons are the best. Like the twistables as well. Thanks for the giveaway. lots of innovative products, but there is nothing like the smell when you open a new box of crayons. I like the Crayola Washable Stampers. I love crayola crayons because they bring back so many great memories. we love the washable crayons! I know this is basic but they have the best crayons. My son loves them! I like their bathroom crayolas. Their crayons are the best! There Crayons are the best. I've always like the Big Bow,with sharpener! The Color Wonder products are AWESOME!! the big box of 64 sets my heart afluttering lol- i love to buy it for my kids! I love their Colored pencils! Thanks for the giveaway! We love Crayola wonder products! I love their First CRayons! the color wonder products are my favorite!! Well, I DONT love Color Wonder but I only buy Crayola brand crayons and markers. I always loved the classic crayola crayons,,nothing beats them! I love their color wonder products! My favorite Crayola product is the modeling clay. My daughter and I enjoy having "Play Clay Day!" My daughter is very creative and it shows on our clay days. My fav crayola product is the one that melts all the crayons into new crayons, saves me money getting new crayons! My fav will always be the 64 box of crayons! I love the washable markers--a must-have for toddlers! I like Crayola washable markers. the dry-erase crayons are my favorite. I use them at work to fill out a dry-erase calendar board, and I can never resist but to draw little stars, flowers, and smiley faces with all of the different colors. The Glowstation products are pretty awesome. I love everything Crayola makes! They are the only crayons I buy!